Saturday will be muggy with a chance of storms throughout the day. We are not expecting any widespread server weather outbreaks, as we saw Friday, but gusty storms with heavy rain are possible any time Sunday. 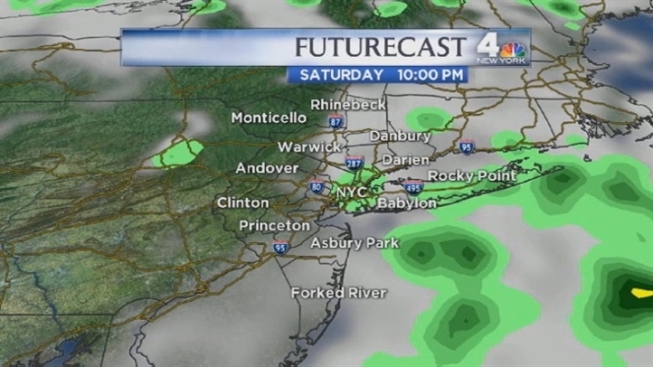 The chance of storms will continue Saturday night and into Sunday morning, especially on Long Island. Conditions are expected to improve late Sunday and into Monday. There is a high rip current risk Sunday at the beach. Tropical Depression 7 may reach tropical storm strength as it moves rapidly through the Windward Islands Sunday. It should then should dissipate Monday. Below are your weather forecasts through Thursday. TODAY: Warm & muggy and with occasional showers and storms. TONIGHT: A few evening storms, some fog. TOMORROW: Storm chance, especially early, then some clearing. A bit less humid. WEDNESDAY: Mostly sunny and warm. THURSDAY: Partly cloudy and warm.